Здесь вы можете прочитать биографию Мела Гибсона на английском языке. 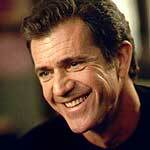 Mel Gibson (born 03.01.1956) - American actor. Way before Russell, Cate and Hugh Jackman, even before Geoffrey Rush and Sam Neill, the Antipodes could boast of a mega-star in the Hollywood firmament. One of the brightest, in fact. For, if you discount Schwarzenegger on the grounds of his cartoonish build and accent, Mel Gibson has been the biggest action hero of recent times. Furthermore, when Mel decided to produce, direct and star in his OWN action movie, he even snapped up a couple of Oscars - a very, very rare occurrence in the genre. Yet Mel Columcille Gerard Gibson isn't, strictly speaking, Australian at all. He was born on the 3rd of January, 1956, in Peekskill, New York, the sixth of eleven children. His father, Hutton, was a brakeman for New York Central Railroad and, considering New York City no place to raise children, moved the family north to Croton-on-Hudson, then on to nearby Verplanck Point and, by 1961, on to a farmhouse at Mount Vision. Times were hard and Hutton figured he'd run the farm and do his rail job too. So he spent weekdays in New York City while the family (isolated by mother Anne's inability to drive) stuck out on the farm. It was tough, but a great place to be a kid. In 1964, disaster struck when Hutton suffered a serious work accident and lost his job. The Gibsons were forced to move into cheap rented accommodation, with the older children having to take jobs, while Hutton entered into a compensation battle with the company. It would take three years to work out. When it did, though, it worked out well. Hutton was a strict and traditional Catholic - having at one point studied for the priesthood - and did not really approve of the cultural changes in the Sixties, regarding the hippies' penchant for mind-expansion and promiscuity as a sad sign of moral decline. Consequently, when he won $145,000 compensation, and a further $21,000 from the Jeopardy! gameshow (very bright, the Gibsons), he decided to take the family to Australia, Anne's homeland (her mother had been an opera singer who'd emigrated to the States). It's been said that the Gibsons moved to escape the draft for Vietnam. Not true. Hutton had served in WW2 and truly despised war, but his sons could still have been drafted from Australia. Indeed, Mel's eldest brother WAS drafted, only to fail the initial tests. Also, Anne had an extended family there which would surely help as Hutton recovered from the accident. So, off they went, via Ireland, Scotland, England and Rome, where the kids were shown their Celtic heritage (Mel's the name of an Irish saint - and it's NOT Melvin) and spent time at the Vatican. They arrived in Australia in November of 1968 and settled in a suburb north of Sydney. Mel was sent to St Leo's College, run by the Christian Brothers, where he was picked on mercilessly for his accent. Rebelling against the repressive regime, he got "whacked around for smoking, fighting, not following their stupid rules". Eventually, Hutton pulled him out and sent him to a state school - Asquith High - where he became a proper Aussie bloke, drinking , brawling and the rest. He did date a little, but usually with his mates along, being extremely shy. After school, he thought of the priesthood, then journalism, but he had no genuine vocation, ending up employed at an orange juice bottling plant in Sydney. His sister Sheila, though, was a big admirer of Mel's elaborately staged jokes, his talent for mimicry and his ability with accents - he had, after all, learned to speak 'Strine. So, she filled in an application form for him to join the National Institute of Dramatic Arts, at the University of New South Wales. Mel went along and, somehow, was accepted. But, after a while, he began to make an effort, conquering the terrible stage fright that had seen him have to sit down during his first ever performance. Playing Romeo alongside fellow student Judy Davis, he was a real success. With his hair and beard removed, people began to take notice of his extraordinary good looks. He shared a flat with Geoffrey Rush and began to exhibit some of Rush's flair and enthusiasm for theatre. At the end of 1976, Mel and his student-buddy Steve Bisley (Bisley would appear, as Goose, in Mel's breakthrough hit Mad Max) met producer Phil Avalon and found themselves cast in the lightweight surfer movie Summer City. They were paid the union minimum of $400 but it was experience, and fun. Mel enjoyed a relationship with co-star Deborah Foreman who, once it was over, was reported to have attempted suicide at a boozy party. The movie was a success in one respect. Mel was taken on by agent Bill Shannahan, who scored him a part in The Sullivans. This was good exposure, but Mel hated TV work, believing time constraints meant little genuinely good work was done. To learn his craft, he joined the South Australia Theatre Company and toured with Waiting For Godot. When renting a room in Adelaide, he entered the kitchen one day to find a pretty young woman, a dental assistant named Robyn Moore, making breakfast. She had a boyfriend then but, by June of 1980 she and Mel would be married, now having seven children. Now Shannahan really came good. He got Mel an audition for the producer/director George Miller, then casting for a futuristic feast of ultraviolence called Mad Max. The night before, Mel got drunk at a party (as he often did) and became involved in a fight with three other men. They pounded him good and proper, and he showed up at the audition with stitches in his head, his nose all over the place and his jaw out of line. Incredibly, he was the perfect Max Rockatansky - possibly the most severely battered hero in screen history. The filming was hard. With a budget of just a few hundred thousand, the cast and crew all lived in the same house, and all helped out moving equipment. And it came off. Mel shone as a cop whose wife and kid are run down and killed by a fearsome motor-gang led by The Toecutter. This, as the title suggests, makes him mad, and he goes after them, giving his final victim the choice of either dying in an inferno or cutting his own foot off. Boosted by word-of-mouth rumours that it was exceptionally brutal - remember, this was Video Nasty time, when many films were benefiting from being banned - Mad Max was a sensation, taking over $100 million. Unfazed, Mel continued his stage education, appearing in Oedipus Rex and Henry IV. Always keen to expand his repertoire, he also starred in Tim, written by Colleen McCullough. Here he played a labourer of below-average intelligence who's befriended by older woman Piper Laurie. Choosing to highlight his character's innocence, rather than his disability, Gibson was charming and convincing, and won the Best Actor Award from the Australian Film Institute. Now came more stage-work, and then the war movie Attack Force Z, a bad experience. Mel was disappointed that director Philip Noyce (later to make Dead Calm and Patriot Games) had left the project and, like the rest of a cast including Sam Neil, was also annoyed at the star-treatment meted out to John Philip Law. After filming ended in Thailand, he returned to Australia and, now married and needing the money, took a part in the prison drama Punishment. Thank the Lord, matters quickly improved. Peter Weir, who'd helped re-generate the Aussie film industry with his marvellous Picnic At Hanging Rock, wanted Mel to star alongside newcomer Mark Lee in the war drama, Gallipoli. The pair would play young sprinters whose athletic careers are halted when they're sent into action in Turkey during WW1. The army uses their talents by having them race through the trenches with important messages, while the British commanders are foolishly and mercilessly sending troops over the top into unanswerable machine-gun fire. It was an extremely moving movie, and not the last time Mel would be involved in Brit-bashing. Both Braveheart and The Patriot would also portray the denizens of this sceptred isle, this earth of majesty, this seat of Mars, this other Eden - DEMI-PARADISE - as a gang of plummy-voiced butchers. He'd answer outraged complaints with a cute and funny "Hey, we're giving the Germans a break". In Australia, of course, it didn't matter. Gallipoli won Gibson a second Best Actor Award. Next came another monster hit, as he returned to Mad Max. In The Road Warrior, we see Max years after the original killing and revenge, wandering the desolate landscape with a hound whose food he selfishly gobbles himself. No semblance of law remains and a community of nice people is under siege by a fantastically dangerous horde of punky marauders. Will Max help them escape with their fuel? Not a chance. At least not until - thanks to the marauders - all his bones are broken and his eyes are popping out of his head. Mad Max 2, undoubtedly one of the best and most exciting action films ever made, was another massive hit and made Gibson a star in America. But, rather than go down the action hero route (he'd turn down a part in The Running Man), he chose to play a reporter in Indonesia when revolution struck in 1965, in Peter Weir's The Year Of Living Dangerously. Here he had an onscreen affair with Sigourney Weaver (they had to raise his shoes for this, though Mel, at 5'9", is not short). Linda Hunt, as his crazy, tiny photographer, would win an Oscar. From here, Mel moved on to The Bounty, playing Fletcher Christian to Anthony Hopkins' Captain Bligh. The cast featured the cream of the British and Irish crop - Laurence Olivier, Edward Fox, Liam Neeson, Daniel Day-Lewis, plus stalwarts like Bernard Hill and Philip Davis and, further down the bill, John Sessions and Neil Morrissey. The movie was filmed on Moorea, an island near Tahiti, and the shoot was marked by some serious drinking sessions. When away from his family (the kids were coming regularly now), Mel would hit the sauce with abandon. It was reported that, on one occasion, he got into another bar brawl and was so badly bruised they had to change the order of shooting. A year or so later, he'd be charged with drinking and driving, receiving a three month ban and a $300 fine. Like many very shy people, Mel found life to be more fun and himself to be more gregarious after a few drinks. But it became a problem and, by the early Nineties, he'd entered a programme to sort himself out. After The Bounty came the first movie where Mel adopted an American accent, when he and Sissy Spacek battled to keep their farm in The River (Spacek would be Oscar-nominated). Then, once again trying to steer clear of action parts, he played a jailbird helped to escape by besotted warden's wife Diane Keaton in Mrs Soffel (helmed by Aussie director Gillian Armstrong). After this came Mad Max 3: Beyond Thunderdome, a fairly weak sequel that featured Tina Turner and, more interestingly, Angelo Rossitto - a dwarf from the brilliant Freaks - as The Master. Now came another monster, Lethal Weapon, the first of a series of four. This was a superior buddy movie, with Gibson playing maverick cop Martin Riggs, constantly taunting the more conservative partner, family man Danny Glover. But it wasn't JUST a buddy movie. One of the opening scenes, where Riggs has lost his wife and is contemplating suicide, saw Mel deliver a truly moving performance, excellent by anyone's standards. With the financial proceeds from his last two movies, Mel bought a 300-acre cattle ranch in the Kiewa Valley in northern Victoria, then a house in Malibu, so he wouldn't have to be away from his family so much, and the kids could stick to the same school. After Lethal Weapon came Tequila Sunrise, where Mel played a drug dealer pursued by an old friend, now a policeman (played by Kurt Russell), with the pair of them falling for restauranteuse Michelle Pfeiffer. Gibson and Russell would become great friends and Mel, who'd been seeking a strong comedy for some years, now made Bird On A Wire with Russell's wife, Goldie Hawn. Then came another war flick, Air America. With the Lethal Weapon franchise now in full swing, this was enough action for a while. Gibson turned down the lead in Robin Hood: Prince Of Thieves (he also turned down the role of James Bond, TWICE - after Roger Moore had departed, and then after Timothy Dalton), and took on Shakespeare's finest, Hamlet. Directed by Franco Zeffirelli, and co-starring such heavyweights as Glenn Close, Alan Bates and Paul Schofield, the movie was a huge risk for Gibson. Some critics jeered, unable to accept that Mad Max might dare to follow in the footsteps of Olivier, but Gibson really was good, more than holding his own in terrifying company. And he kept on with his "interesting" projects. Next came the tear-jerking Forever Young, where he played a man frozen for fifty years, then woken up by Elijah Wood (later Frodo Baggins in The Lord Of The Rings). Then he played alongside another kid in Man Without A Face, where he played a horribly scarred recluse who becomes a young boy's mentor. Importantly, this was also Mel's first directing experience - the thoroughly unlikely practice run for Braveheart. Mel had formed a production company, called Icon, and had signed a $42 million, four-picture deal with Warners and got moving fast. Mel's love of opera (inherited from his gran, probably) and classical music led Icon to produce Immortal Beloved. Later, they'd make Anna Karenina, 187 and Fairy Tale: A Love Story, the last of which would see Mel turn up in the last shot as the little heroine's daddy, returned from the war. First, though, there was the Mel-starring Maverick, written by William Goldman and directed by Lethal Weapon's Richard Donner. But it was Icon's next production that made Mel undeniably the biggest star in Hollywood. Randall Wallace (later to write Mel's We Were Soldiers), sent a script to Icon concerning William Wallace, a Scottish hero who, partly for freedom's sake and partly due to the brutalizing of his wife, went to war with Edward I and nearly won. Mel, who'd always love epics like Spartacus, went for it. The wife angle was familiar too, with Gibson taking to calling his character Mad Mac. As said, aside from the infinitely smaller Man Without A Face, Gibson had little experience of directing, and none of directing on this scale - and he knew it. Filming in Ireland, he took to carrying around a book he'd had made, titled A Beginner's Guide To Directing The Epic. He had, though, done his homework, studying the battle sequences in Kubrick's Spartacus and Orson Welles' Chimes At Midnight. He knew what he wanted and, with the help of the Irish army reserve, serving as extras, he got it. Braveheart was a mighty achievement. Aided by great performances from Gibson, Angus Macfadyen as Robert The Bruce and especially from Patrick McGoohan as Edward Longshanks, it was invigorating, touching and tremendously brutal. The battle sequences were amongst the best ever filmed, and the story-telling was strong too. Gibson surprised everyone - for action films are not traditionally the Academy's favourites - by taking the Oscars for Best Picture and Best Director. Turning down the role of another Brit icon, Steed in The Avengers, Gibson moved on to a string of huge hits. In Ransom he played a rich man taking all manner of crazy risks to rescue his kidnapped daughter. In Conspiracy Theory, co-starring Julia Roberts (who he kept sending dried rats) and directed once again by Richard Donner, he was a geek cabbie who gets drawn into a real CIA plot. Then, after Lethal Weapon 4, where Martin Riggs was unfortunately a parody of himself, there was the harsh and thrilling Payback, a remake of Lee Marvin's Point Blank with Gibson as Porter, calmly and coldly beating and threatening everyone till he gets his money back. Mel had every right to be a bit tetchy - he suffered appendicitis during the shoot and production was halted for a week while he was in hospital. After this came Wim Wenders' more arty The Million Dollar Hotel where Gibson played an FBI agent investigating the bizarre occupants of run-down hostelry. The movie was apparently based on the ideas of U2 singer Bono, his band having performed on top of the same hotel when filming the video for Where The Streets Have No Name. After this, Mel provided the voice of Rocky Rhodes The Rhode Island Red Rooster in the animation Chicken Run (he'd earlier provided the voice of John Smith in Disney's Pocahontas). Now came two more Big Ones. In The Patriot, as Colonel Benjamin "Ghost" Martin, he took on the English forces during the American revolutionary war. The movie was a tad sentimental and borrowed heavily from Michael Mann's superior Last Of The Mohicans. But audiences lapped it up, as they did Mel's next offering, What Women Want. Here he was ad exec Nick Marshall, a macho sexist who, having been electrocuted in the bath, can suddenly hear what women are thinking. This, of course, causes much hilarity, both in his "romantic" life and in his relationship with his teenage daughter who's plotting her first sexual experience. The movie made well over $300 million, and aside from winning him a Golden Globe nomination (he'd also received one for Ransom), it justified Mel's now incredible pay-packets. For The Patriot he received a then-groundbreaking $25 million. On he went to We Were Soldiers, the true story of a band of 400 elite US soldiers surrounded by 2000 North Vietnamese in one of the bloodiest conflicts of recent times. Like Saving Private Ryan, much of the movie was an extended battle sequence, but it was searingly effective, nonetheless. And there was also emotional weight added by Mel's relationship with his screen wife, the excellent Madeleine Stowe. After this, he took the lead in Signs, M. Night Shyamalan's follow-up to The Sixth Sense and Unbreakable. Here he played Father Graham Hess, an Episcopal minister who discovers crop circles in his fields in Buck County. But how did they get there? The media descends en masse and Hess does some research of his own, discovering to his horror that, well, as with all of Shyamalan's work, don't let anyone tell you the ending before you've seen it. Signs was a grand reinvention of the modern terror-flick and was another massive hit for Mel. Recouping a budget of $62 million in its first weekend, it topped the box office charts, later returning to the top for another two weeks. Soon passing the $200 million barrier, it was America's biggest summer hit, even outdoing Goldmember. Having been a star for twenty years, Mel Gibson is now one of the biggest. Thankfully, he still works hard to produce good material and, perhaps better still, refuses to take his celebrity seriously. When voted The Sexiest Man Alive, for instance, he said "That implies there are a lot of dead guys who got more points than me". Various things keep his feet on the ground. There's his religion - he remains a devout, traditional Catholic, attending mass in Latin, and he's had a chapel built on his grounds. There's his family to whom he is vociferously devoted (his brother Donal is also an actor and has appeared in many Mel films - Maverick, Braveheart, Conspiracy Theory and Immortal Beloved). But perhaps it's mostly because of Australia. His character was formed there, his career was launched there, and they know it, in 1997 making him an Officer of the Order of Australia, the highest award they have. So forget the beginning, the guy's obviously a fair dinkum Aussie.